Thanks to Mrs. Gilmore's suggestion, I picked up this book as a potential book to read with my tutoring child and I am SO glad I did. The story is about Ivan, the shopping mall gorilla, who has spent all of his life in this shopping mall circus performing day after day. Ivan is an artist and aspires to make it to this "zoo" that he hears about on TV. He starts to use his art as a way to express himself and hopes to break out of the shopping mall to make it to the mall. I think this could be a great read aloud to lower grades like 2nd and 3rd but then a great literature circle book or class book study for 4th and 5th grades. 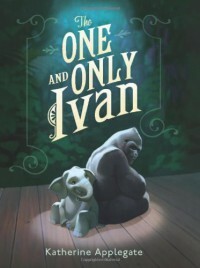 It is based on a true story about Ivan, a gorilla who spent 20 years in a shopping mall space and finally was loaned to the Atlanta zoo until his death. That would be a great non-fiction tie in. Its a really quick read, I would suggest reading it to use in your future classroom.